Jones Management Services, Inc represents a diversified group of businesses including: Check into Cash, Inc., Loanbyphone.com, CIC Financial, Jones Properties, LLC, Jones Airways, LLC, Crescent H. Ranch, Janie, Village Green Town Center, The Spot and The Bald Headed Bistro. Check Into Cash Inc., pioneered the payday advance service. At Check Into Cash payday advance centers, the procedure is simple: A cash advance customer issues a check payable to Check Into Cash from a personal checking account. Check Into Cash provides the customer with the cash needed – instantly! For a one-time flat fee, a Check Into Cash payday loan customer can obtain money in a manner that is QUICK, EASY & CONFIDENTIAL®. Check Into Cash’s payday advance service has been well-received since its inception. The average Check Into Cash payday loan customers are people who occasionally find themselves a little short on cash before payday. Established in 2003, Loanbyphone.com provides Check Into Cash customers with the convenience and privacy of applying for a faxless payday loan or cash advance online or by telephone. As a wholly owned subsidiary of Check Into Cash, Inc., Loanbyphone.com adheres to the same high standards established by Check Into Cash and the Community Financial Services Association of America (CFSA). Loanbyphone.com offers online cash advances and payday loans from $100 to $1000 (depending on the customer’s state of residence.) In addition, in response to customer feedback, Loanbyphone.com has added other online services like no fax cash loans and telephone loans. Buy Here Pay Here, USA specializes in "in-house" financing, with programs to fit all types of credit. We have a large selection of previously owned vehicles in our inventory at Buy Here Pay Here, USA- cars, trucks, sport utilities, minivans, and cargo vans. Call our Sales Team and they will be happy to answer any questions about our inventory. The Village Green Town Center is a 1960s shopping mall that has been refurnished and has become Cleveland's premiere business center. Originally built in early 1960 as The Village Shopping Center, it once housed major retail outlets for the community. Today, the 19.5 acre campus is a high-tech business and professional center with specialty retail and service-oriented businesses. 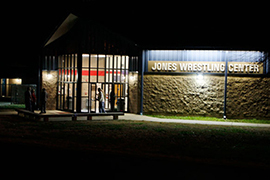 Owning and managing commercial and residential properties in Cleveland, TN., Jones Properties has several building listed on the National Register of Historic Places. Two corporate aircrafts, a Challenger 600 and a Citation V Ultra, are utilized for executive travel. Full time pilots are on staff with offices and hangars located in Chattanooga and Cleveland, TN. The Bald Headed Bistro is certainly a name that people won't easily forget. Once you visit, the delectable menu will beckon you to return again and again and again. Desiring to bring part of the western experience to his hometown, Allan Jones began planning a restaurant in Cleveland , TN., to bring the “western dining experience to the heart of the south…” Thus, the Bald Headed Bistro was born. The Village Barberettes are bringing back the classic neighborhood barbershop, with a twist! Instead of barbers, we offer “barberettes,” five skilled stylists who specialize in cuts and color to suit the whole family. Stop in and enjoy contemporary hair styling in an old-fashioned, friendly atmosphere. As Bradley County's Official Halloween Goblin, Tall Betsy appears to over 25,000 trick or treaters each Halloween night at Downtown Cleveland's Halloween Block Party.